I find the Welsh Assembly unbelievable, and their powers under their Eradication order defies belief. What country are we living in? These are local residents of the cull area whose rights have been removed almost entirely by this Assembly. If this is devolution, then it is wicked. Thank-you for covering this. I am a landowner in the `cull` area and am anxiously awaiting a visit from these contractors. Today I have phoned the Welsh Assembly Government, the WAG Bovine TB helpline, the local police and the Bovine TB police, in the hope that when I am working alone on my land this situation will not happen to me. No one has reassured me, I have not been able to speak to anyone who even seems to know what is going on and no one has called me back. 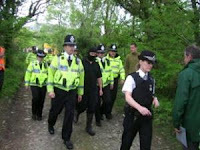 This now goes beyond whether or not one agrees with a badger cull, it moves into the realm of human rights and I feel, as I live in fear of masked contractors accompanied by the police,turning up uninvited and without prior notification on my private propery that I am being stripped of these rights. Why the need for so many police vehicles and officers? I know the community involved and always found them to be peaceful, non violent people! Why the balaclava helmets? I understand the surveyors are not even local people - is it because they have something to hide or are ashamed of what they are doing? I wonder what would have happened if the protesters/landowners started to wear helmets - they have a right to privacy too and have far more to lose than contractors who are all paid well for what they are doing. This is going to put a lot of law abiding systems off protesting - or was this WAG's plan? All this is very sad, a disgusting waste of taxpayers' money and I cannot believe what is happening. Why can't MPs and AM's put a stop to this appalling behaviour by a government body and what an absolute waste of public money and at a time of financial crisis? I emailed our MP, Jonathan Edwards, as my family was disgusted at this behaviour in a so called democratic society. His response is below. I have asked him to make appropriate representation. I also live in the cull area and share Jade's concerns. If this level of paranoia is being generated by the surveying, what on earth will it be like once the shooting begins? Can we expect anonymous, masked contractors, roaming our land at all hours of the night, armed with guns and escorted by hordes of police drawn from outside the area, all at public expense? Even at the £10 million price-tag admitted to by WAG as the cost of killing 1500 badgers, it works out at £6,000 per dead badger. It's madness and I pray every day that sense will prevail and it will be stopped before the killing begins. I can confirm that I was the person arrested for 'theft' - meaning that I was holding the cards given to me in order to identify the contractors by the photo, and was trying to do so as we are advised by WAG. I was only hesitant to both give the cards back without seeing their face and allow them free access to our land. If they were willing show their faces so I could ID them, or to leave and agree to come back with a proper appointment, the would have had their cards back immediately - nor was there ever any suggestion that I would keep their cards indefinitely. They also turned up without a reasonable notice (barring "sometime next week") when my elderly and disabled father was alone on the farm. It is pure chance that I turned up when I did - I had been called to assist supporters at the simultaneous invasion at Brithdir Mawr and had returned to the farm to fetch my camera. My father was trembling with shock at the invasion of WAG officials, contractors and police in a riot van and I am disgusted at this underhand and heavy handed action. If, as they claim, they have the support of most of the landowners they have absolutely no need to carry out a cull - the RBCT on which they are basing all their scientific support did not force entry onto objector's land, and these days we have the option of vaccinating badgers in unculled areas. £6000 per badger for the cull! no doubt this will be paid out of local community charge bills. Where are the Police being diverted from? to attend the first of many visits to the killing fields of Wales. And finally I'm sure if land owners or protesters covered their faces then they would be arrested. I think the cull should stop before any more trouble is caused or badgers slaughtered. It won't work, you'll still have TB and perhaps you need to look at the movement of cattle as opposed to persecuting wildlife. It is absurd really for the welsh assembly to say that the 'masked men' were going about their lawful business when landowners tried to prevent them entering their land to survey it for setts. This is a really void and arrogant statement as the assembly government tailor-made that law to suit themselves. The good people who tried to prevent them are depicted by the assembly government as 'criminals', when really we all know they are, and have probably always been, very law-abiding citizens. I note the huge number of (state?) police at the scene - when my property was burgled two years ago, when I phoned the police (about 20 mns after it happened) I was told they didn't have any one 'free' to come around straight away, but someone would come around in about 20 mins - 25 mins later, no sign of police, burgulars well gone by then. After then shouting down the phone, one officer turned up about half an hour later. What a difference! The welsh assembly is a disgrace - I hope we never fully devolve - imagine if they had 'absolute' power. I'm off to my welsh language class now - I only speak english so I'm more half screwed for working in the public sector, thank you plaid! We are definitely progressing toward dictatorial rule. This is very disturbing, on all sorts of levels, but surely if these people are prepared to take money for slaughtering the badgers they should not be able to do so hiding under a balaclava. As for ID cards without names on them - only Labour could dream that one up (and only Plaid could abet it just to appease their rural farmers 'base')! To the set surveyors... Twenty five years ago I was raped by a man wearing a balaclava who threatened my life. I can only shudder at what is being reported from beautiful Cilgwyn. We all need a wage, I appreciate that... but please ask yourselves what you are being asked to be a part of... I don't blame you at all individually, but please, collectively, think about it.